The Evelyn Quilt. 40" x 40" handmade star block quilt. Baby girl quilt. Ready to ship. Homemade Baby quilt, quilt throw, lap quilt, wheel chair quilt. Handmade Star Block patchwork quilt. 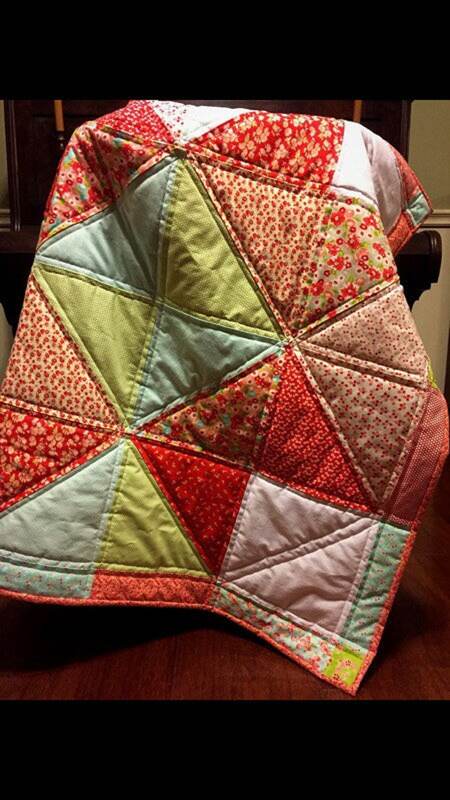 Baby quilt, quilt throw, lap quilt, wheel chair quilt or crib bedding. Keepsake quilt. Modern quilt. Gift for her, mother to be, baby shower gift, birthday gift, christening gift, Christmas gift or gift for grandparent. Made with Moda "Little Ruby" coordinated fabric collection by Bonnie and Camille. Hypoallergenic low loft poly batting. Hand sewn binding for a beautiful finish. Pink, red, blue, green, white, ivory, mustard, mint, blush,barn star block, vibrant, colorful, stunning, security blanket, cuddly, lightweight, pretty, beautiful, cute, country, rustic, vintage style, modern, and unique. Straight line quilting. Crafted with love in a smoke free, pet free home and washed before shipping. Measures 40"x40". Made from 100% fine quality quilting cotton and hypoallergenic batting. Washing instructions: Machine wash cold. Tumble dry low. Warm iron if needed. The Christy Quilt. 40" x 40" handmade star block quilt. The Evelyn Dress! Baby girl's fully lined dress and bloomers to match the handmade Star Block Evelyn quilt! The Betty Apron. Baker's half apron. Beautiful, functional and flattering! Wrap around tie back and pockets! The Betty Napkins. Cloth Dinner napkins. 16" x 16". Comes in a set of six for pretty table setting! Good Vibes. Boy's romper, fully lined, with appliquéd necktie. Just Groovy. Girl's Jumper, fully lined with pocket detail. Purchased for Mother's Day! She loved it! Very well made and high quality material used. Will do business with again! Cheers! The Katie Quilt. 45" x 45" handmade star block quilt. Want another print, size, or design? I'd be more than happy to customize your order. Feel free to contact me with your request.